The more I see Brexit’s Andrea Leadsom, the more I am reminded of Carly Fiorina (the US business leader who forced the HP acquisition of Compaq, and more recently attacked Hilary Clinton and Planned Parenthood in a particularly unpleasant way). She has the same unshakeable belief in herself, the same glossy self projection, layered over a potentially disastrous master plan. And it appears, the ability to dissemble on an industrial scale. Carly however only did for Hewlett Packard. Andrea can destroy a much bigger target. There are it has to be said, many many dumber and more treacherous men in the Tory ship of fools at the moment, but I have seen that manic glint in Andrea’s eye before and it’s a look that spells danger. Let’s look a little more closely at her. Firstly she has only been for Brexit for 3 years. In 2013 she said: “I don’t think the UK should leave the EU. I think it would be a disaster for our economy and it would lead to a decade of economic and political uncertainty at a time when the tectonic plates of global success are moving. Her justification for the Brexit U-turn is that she concluded over the intervening 3 years that the EU could not be reformed. But EU reform has nothing to do with the damage to the UK of exiting the EU. None of the UK exit options have changed in the last 3 years. All that has changed is her rise up the Conservative hierarchy. Which as we will see below may have been fueled by a rather sinister source. The offshore financier is Peter De Putron, a very shadowy individual who is based in Guernsey. Andrea Leadsom was Managing Director of De Putron Fund Management between 1997 and 1999. De Putron’s wife, and Andrea Leadsom’s sister, Carolynne Hayley de Putron, is currently head of investor relations at De Putron Fund Management. Mr de Putron wrote out cheques to the Conservative party totalling £200,000 in 2010, £66,600 in 2011, £129,800 in 2012, and £204,760 in 2013. The donations from De Putron were channeled to the Conservative party via a company called Gloucester Research. This company was run by Andrea Leadsom’s husband, Ben Leadsom. 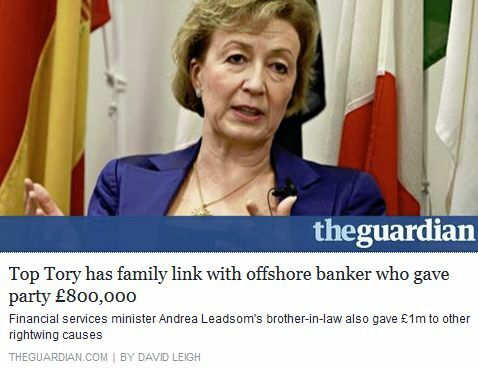 In 2014 Andrea Leadsom, 4 years after a deluge of cash was given to the Conservative party by her brother-in-law and husband, was appointed to a junior cabinet position. The donations were exposed later that year by the “Jersey files” which were leaked from Kleinwort Benson to the International Consortium of Investigative Journalists. Had this leak not occurred, no-one would have been aware of the massive potential conflict of interest. Like many of the large-scale falsehoods from the Brexit camp, Leadsom’s denial beggars belief for many observers. A company run by her sister and brother-in-law channels nearly a million pounds to her party via her husband over 4 years, and she is totally unaware of it. 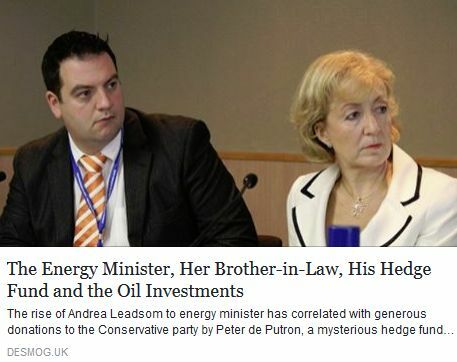 The financial manipulations of Leadsom’s brother-in-law are entirely offshore, and largely secret, but they involve a major hedge fund, and investments in oil and other energy assets. His interests are totally at odds with those of the poorly paid in the UK, who Leadsom publicly claims to be driven by. 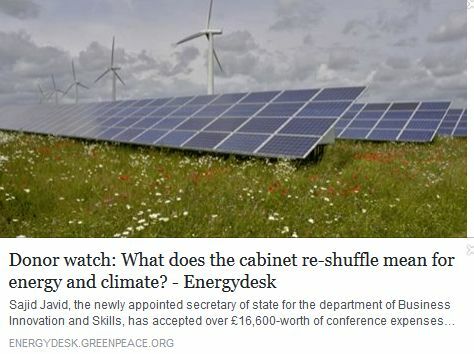 It is no coincidence that Ms Leadsom currently serves in David Cameron’s government as a junior energy minister (where she supports fracking). This is precisely the greatest area of interest of her rich sponsor, de Putron. 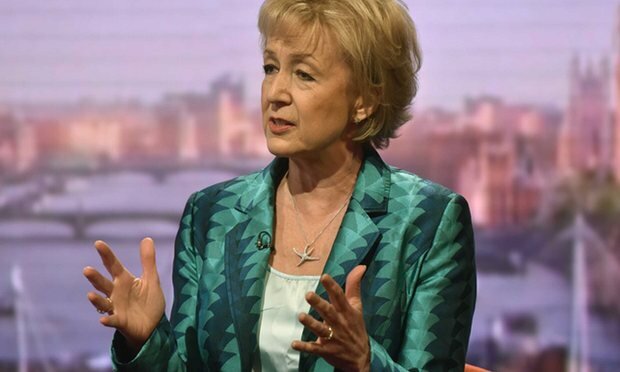 As reported in Private Eye and the Independent, “Leadsom has also received around £80,500 in donations to her campaign and her constituency from her brother-in-law Peter du Putron, according to an Energydesk analysis of Electoral Commission data. The vast majority of these donations from de Putron (bar one, £4,999 in 2010, which was in his name) came through Gloucester Research.run by Andrea’s husband, who also gave £10,000 to his wife’s campaign and her South Northamptonshire constituency in his own name. A spokesman for Leadsom said: “No member of her family has ever sought to promote her political career”. This would appear to be a statement so at odds with the published facts that it once again defies belief, even for a Tory minister. Leadsom’s concern for the little man also is at odds with her personal financial dealings. Separately, Ben Leadsom, her husband, is recorded as receiving offshore loans to grow their business. Three loans from the Channel Islands were used by the Leadsoms through their property company to acquire buy-to-let houses in 2004, plus, in 2006, the couple’s own £1.3m mansion in her rural Northamptonshire constituency. But some say this murky support doesn’t matter – she has years of experience, and is a super efficient top achiever. Perfect for leading the UK into Brexit. 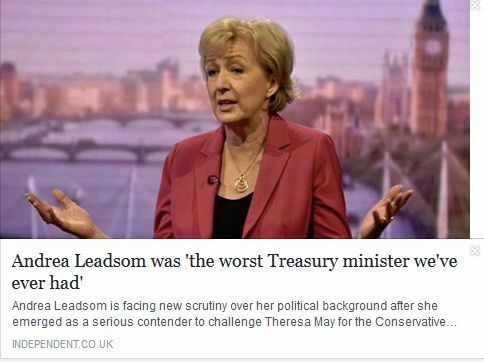 Not so apparently, according to the FT and the Independent: “officials in the Treasury, where she worked as a junior minister from April 2014 to May 2015, have issued an extraordinary criticism of her track record in government. “She was the worst minister we’ve ever had,” one unnamed City official told the Financial Times. “She found it difficult to understand issues or take decisions,” another said. “She was monomaniacal, seeing the EU as the source of every problem”. 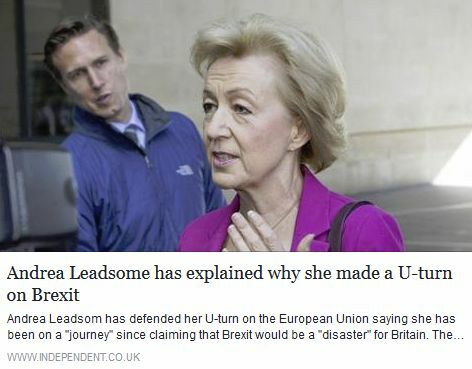 So, Andrea Leadsom – a low level, low (ministerial) quality ideologue, possibly influenced by a very rich and shadowy offshore investor, is at the point of leading this country into disaster. The parallels with Carly Fiorina are quite striking (including the incompetence). But there is one major difference. Despite the application of truly huge amounts of money ($22.6m just for her failed California Senate bid) Fiorina has so far failed to obtain any elected office. It was much, much cheaper to get Leadsom into a position of power – only one million pounds or so seems to have been required. It seems pretty clear that the sinister sounding Peter de Putron may have acquired himself (through marriage and other means) not just a minister, but possibly a Prime Minister, and one who could promote his interests while championing herself as a supporter of the low paid. An investment that would make any offshore hedge-fund operator proud. 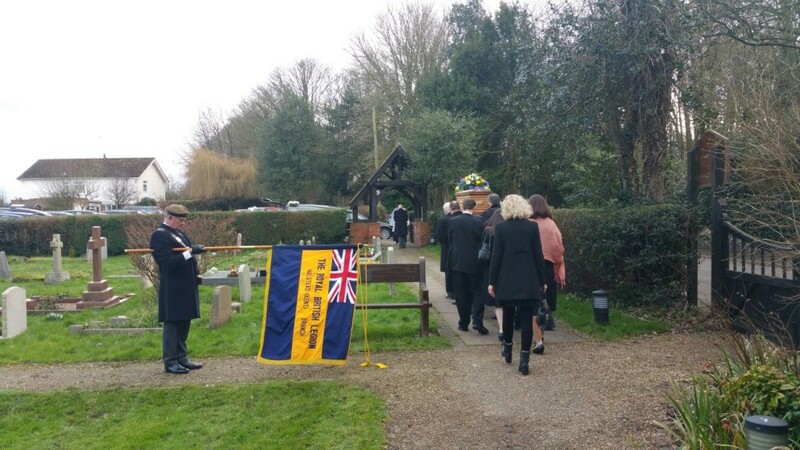 My dear father, Harry McAughtry passed away on 8th February this year, and his funeral was held at the quiet Kentish church in Halstead on 19th February. As always when he was involved, the occasion brought together family and friends, but this time to share in our loss, and remember his life and his influence on ours. It was an emotional day, and one for reflection also. Harry had a really interesting life, through turbulent times, and he achieved a lot. So along with family personal memories at the funeral, I wanted to give a picture of what the sweep of his 94 years had been like. The text below is the eulogy I gave, augmented here and there with a bit more detail, and with photographs from the order of service, and other sources. In the summer of 1937, my mother and father met at St Abbs Haven, in Northumberland and that encounter was the beginning of an 80 year love story. This afternoon, I wanted to tell you a little about what happened next, to give you a glimpse of the adventures he and Joyce had over those 80 years. Harry met Joyce when he was 16. Actually, last year he told us a bit more about that meeting. It seems that every year there was a skit put on by the boys staying at the haven. That year, it was to be a mock wedding. Owing, he said, to his unparalleled beauty, Dad was going to be the bride. So he walked up to Joyce, who he’d had his eye on, and said do you have a white dress. She said yes. And he said, would you mind if I borrow it as I need to wear one tomorrow. One of the more original chat-up lines and the start of a wonderful relationship. 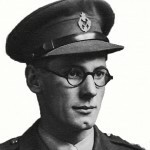 The next year, with war looming, he entered Glasgow University and he graduated in 1941 with a degree in Civil Engineering. He was immediately called up into the Royal Engineers as a Sapper or private. But within a year he was moved to the Royal Electrical and Mechanical Engineers and was commissioned in October 1942 as a full Lieutenant. The Photo on the left is him in uniform in 1943. It turned out he was in REME for for a special mission. 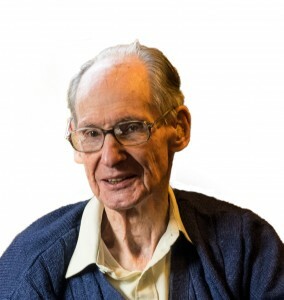 In 1943, the year he got married, Harry was sent to a discreet house in Petersham, in Richmond, to attend the first training course on a new top secret radar system. 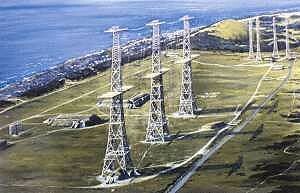 Britain had invented radar, and by 1937 had built radar towers all along the south and east coast. The original radar stations were huge towers, over 300 feet high – quite unlike today’s radar systems. They enabled us to win the Battle of Britian, but there were problems with the first designs. They couldn’t detect low flying planes, or their height, and only looked out to sea. Something better was urgently needed, with more efficiency and more power. In 1940, at Birmingham University, something called the cavity magnetron had been invented, which enabled microwave radiation to be produced at incredible efficiency. You all own one by the way – it’s what powers your microwave ovens. It turned out to have huge potential for radar, and a massive effort was undertaken over the next few years to turn that into reality. In March 1943 the first truly modern radar intercept system with this new radiation source was built, and that’s what Harry had been selected to work on. It was called the AMES type 13 radar – and from from then to the end of the war, Harry worked installing and running these and other systems into radar stations around the south and east coasts. From then on the efficiency of German aircraft detection was greatly improved, and these systems were later used to shoot down the V1 bombs also. 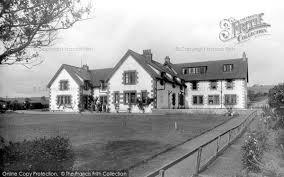 Dad was decommissioned in 1946, and went back to Glasgow with Joyce, where John was born in August. That year they had a chance conversation with a friend about Malaya, and Harry applied for a post in the railways there. So in 1947, at the age of 26, after having spent their entire working and married life in a world war, Harry and Joyce arrived in the impossibly exotic and warm far east, where they spent 10 very happy years. He was a careful man as most of you know, and he had heard from someone that Malayans washed clothes by pounding them with rocks. 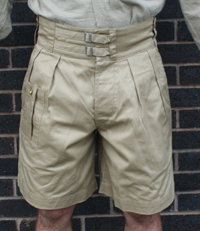 So he bought 90 pairs of Army surplus shorts to cover the wear and tear – which turned out to be about 85 pairs too many. He was still wearing them twenty years later. Dad’s main job in Malaya was as District Engineer. That job involved responsibility for all bridges, track, stations and building, and for the many hundreds of staff and gangs that worked there. 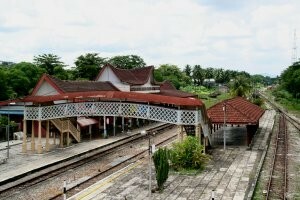 The first big posting was in Bukit Mertajam, near Penang on the west coast, where I was born. There he looked after 250 miles of track that crossed the jungle and multiple rivers and went right up to the Thai border. Bernard North took over from my father in that job, when he was only 22. The other day he told me very movingly how un-colonial, and unstuffy Harry was. How he treated everyone fairly and as an equal. Harry established long term friendships with his staff, and was in correspondence with them for years, until very recently. He had many great stories about those times. One of them was of John or me (I think it must have been John), refusing to go to bed when Dad had received a visit from the new Railways General manager. When asked why we wouldn’t go to bed, the answer was, oh you said “the general manager drinks like a fish”, and we haven’t seen him do that yet! On Malayan independence, in 1957, we returned to Britain, and in 1958, Harry joined George Wimpey and the family moved to Kent. 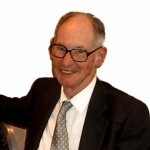 Harry worked at Wimpey for over 25 years, and had many adventures during that time. 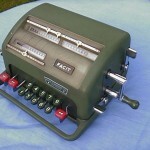 His job was estimating the bid price for very large international contracts. This involved going to the job location to see where to find the raw materials, how the transport would be managed, where the hundreds of workers would be housed, and so on. He traveled all over the world – to the Emirates for the huge Das island oil rigs, to Lebanon and Turkey for the Euphrates dam tender, to Romania for a giant irrigation project, Brazil, and many more remote and exotic locations. And of course to Peru, which made a huge impression on him when he saw Machu Pichu Inca city, and which he took his grandchildren back to many years later. In going through some papers at home I found a letter from Dad to mum, written from Oran in Algeria. In a note scribbled at the top, he wrote “ PS. I’ve been listening to tapes of F Sinatra esq. Which get me feeling very sentimental and missing you achingly. I do love you so much darling”. Once Dad got back from his travels, it was then a race to get the tender priced and submitted. He worked every Christmas day that I could remember, and always seemed to be working to a deadline. I never saw anyone work harder than Dad, and he did it almost all his working life. After his retirement from Wimpey, at the age of 63 he went to work full time as a software programming consultant. One of the first things he did was the database design for a large London Cab company. When he left that job, I mentioned the vacancy to one of my oldest friends M*chael Br*phy, and Mick applied for the job. I don’t think Harry knew Mick before this, but the day of the interview, in a greasy spoon cafe round the corner, Harry gave him a detailed briefing on the job, which enabled Mick to amaze the company with his detailed knowledge. And Mick got the job, which launched him on his successful IT career. That generous gesture was very typical of Harry and was an example of how he helped and mentored dozens of people during his career. Round about that time, Gina’s Environmental publishing business was growing fast, and desperately needed an automated finance system to run the business. We talked about this in passing to Harry, and he offered to help. In his spare time, Harry wrote a complete and very sophisticated suite of software to manage the subscriptions business, and meticulously documented and maintained it. That code sat at the heart of Gina’s business for 25 years, and continued to run the subscriptions as the business grew. It was still there and being used when she sold the company to Michael Heseltine and the Haymarket press in 2004. 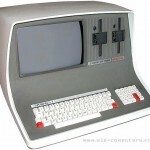 It was one of the few examples I know of a computer program being created out of love, and it was a classic piece of code, much loved in return. 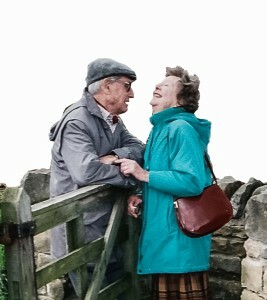 By now Harry and Joyce were in their 70s. Harry had always wanted to travel and take Joyce to India and South America, but her health was starting to fail, and they kept their traveling mostly to to Europe . But they loved touring about in France and Spain and the UK, and had done it ever since John and I were married and away. They traveled mostly without making any plans – just arriving in a town with the Michelin guide and hoping for the best. For the first time in his life Harry was not working, and was able to relax and take things easy. 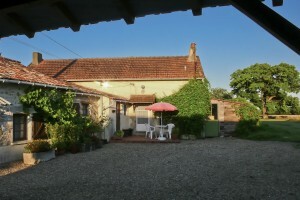 Towards the end of that tim e, Gina and I bought a small French farmhouse near Poitiers called La Rocheliere, and for the next 10 years, Joyce and Harry spent 6 weeks every spring there, and loved it dearly. It became their house more than ours, and it still reminds us of them whenever we go. His notes, instructions, piles of 2B pencils, and his meticulously organised desk are all still there and will be as long as we live. 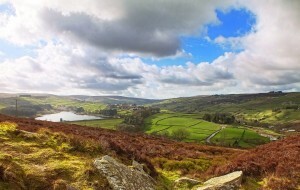 But in 2006 Joyce became extremely ill, and the traveling had to stop. For the first 3-4 years after then, Harry became Joyce’s full-time carer. He worked his heart out 18 hours a day, cooking, cleaning, shopping, and managing support, taking over every item of running the house. Then fortunately our lovely carers took over and Harry could relax a bit again. So Harry had a wonderful life. He was with the love of his life for 80 years. They had great adventures together, and although they faced danger, they ended up safe. With John and me and our wives and our children and grandchildren, they had a family they dearly loved and who loved them back. And he had wonderful qualities which he passed down to all of us. He was the politest and most considerate man I have ever known. He was funny, really intelligent, loving, incredibly hard working, and very very generous. I have never known a finer man, and I know that I never will. I’ll miss him dreadfully, and I can hear his voice and see his smile every day. Now both our parents are gone. But they won’t be alone. 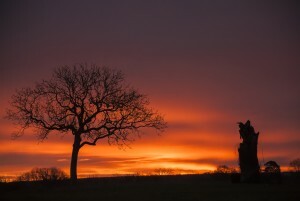 We”ll be placing their ashes together under the walnut tree in la Rocheliere in France and in the windswept cemetery in Yorkshire that you see in the photographs below. They will be together again and till the end of time. Two of the finest kindest people that ever lived. We are all so sad. On the morning of 8th February, my kind, funny, and wise father Harry McAughtry passed away. A quiet hero for me all my life, he was a beacon of honour, humility, and selflessness. Along with my lovely mother he taught us all how to live, and he taught me how to live a logical life, and how to laugh at it. He passed quietly, without pain, and his final wishes are being honoured. I’ll write more about him soon, but I miss him more than I can say. His funeral will be held at St Margaret’s church, Halstead, Kent on the 19th February at 1:45 for 2:00 pm, and all who knew and loved him are welcome to come to the service and to join us afterwards. 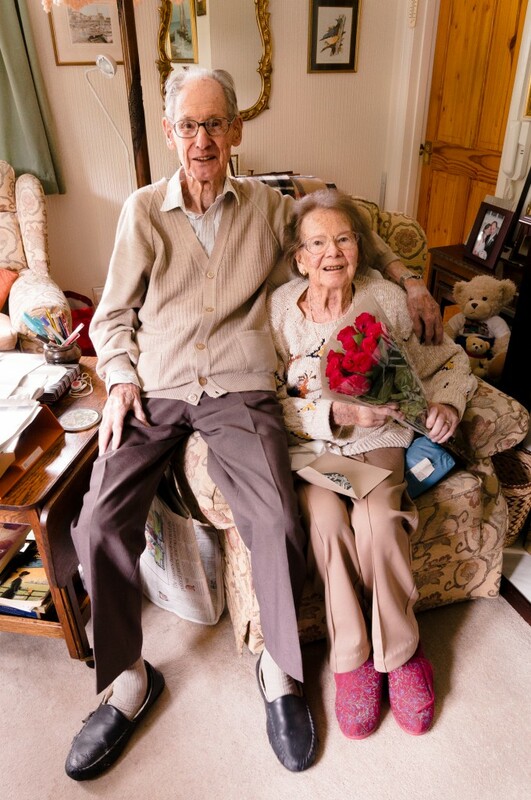 Full details are shown below the photo – which is of Harry and Joyce at their 70th wedding anniversary, in 2013. The funeral will be held at St Margaret’s Church, Halstead, Kent, at 1:45 for 2:00pm on Friday 19th February 2016. There will be a reception following this for family, and friends at Halstead village hall, which is a short drive from the church. Details and Google map links for both locations are given below. If you would like to send flowers with the hearse, please contact Forget-me-not on 01689 853261, and mention the Harry McAughtry funeral. If you are in the area, they are located next to the Funeral Directors in Crofton Road. Alternatively please make a donation to Oxfam or a charity of your choice.